Eighteen years ago, a seminal book in music history was published, Please Kill Me: The Uncensored Oral History of Punk by music journalist Legs McNeil and poet Gillian McCain. DEAR NOBODY is the heir to books like Go Ask Alice and The Bell Jar, but in this case, it’s all true. 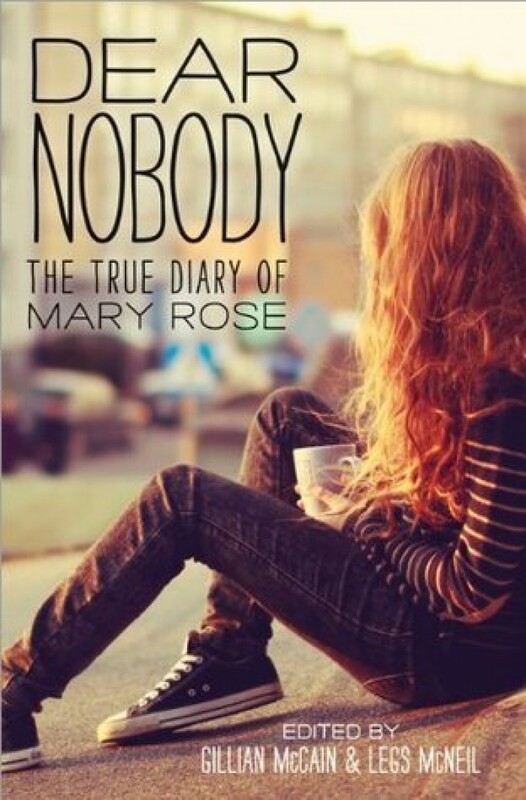 Mary Rose is an authentic voice – and we’re right there alongside her as she experiences love, heartbreak, happiness, depression, drugs, alcohol and emotional and physical abuse. Mary Rose conveys the horror of her teenage years in the same way Anne Frank encapsulated the Holocaust. Like the musicians Gillian and Legs interviewed for their book, Please Kill Me: An Uncensored Oral History of Punk, Mary Rose’s secret chronicles were sometimes brutal, sometimes profoundly funny and revealed an edgy, no-holds barred tale of a social misfit. They believed so powerfully in her story – and that it should be shared with the world – that they spent over $35,000 dollars of their own money and nearly 5 years in court to make sure that Mary Rose’s voice would not be forgotten. Now, Mary Rose’s blunt, harsh, occasionally obscene, but passionate words can be published. DEAR NOBODY is a not-to-be-forgotten book that is destined to be a true diary classic.